Eurowings has continued to expand its winter flight schedule with he addition of Las Vegas. The Lufthansa-owned point-to-point airline earlier revealed plans to offer Barbados, Mauritius, and Windhoek in Namibia later this year. Eurowings has begun operating six weekly flights from Düsseldorf to New York’s Newark Liberty International Airport. The service is in addition to its existing connections to and from JFK. Around 100,000 items of uniform were needed for the changeover, averaging out at about 30 garments and accessories for each flight attendant. Frank Bauer has been appointed to the roles of managing director and chief financial officer at Lufthansa subsidiary Eurowings. The 37-year-old has been responsible for finance, human resources and technology at the carrier since the start of the month. Eurowings is reaching the end of a project to integrate 77 aircraft from failed rival airBerlin into its fleet. Over the past nine months the planes have joined with the airline, with an Airbus A320 from lessor Magnetar with 174 seats and the registration D-ABDT, marking the final hurdle. A new partnership between Eurowings and mytaxi is seeking to offer passengers a stress-free airport arrival. With just a few clicks, passengers can order a mytaxi directly from the Eurowings app for seamless travel. The German National Tourist Board UK & Ireland hosted a food tasting event in London last night for over 100 guests from the UK media and travel trade. 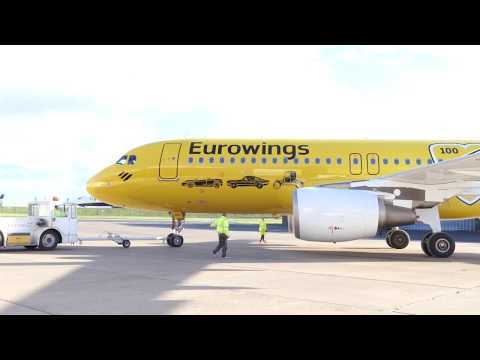 Eurowings plans to set up its own digital company by the end of the year. The aim of Eurowings Digital is to bundle all the airline’s customer-relevant digital activities under one roof. German low-cost carrier Eurowings has launched a direct flight from Düsseldorf to Fort Myers in the USA. Passengers will fly to the southeast of the United States three times a week (Tuesday, Thursday and Saturday) and can also combine their flights to or from Düsseldorf with a connection via Munich to optimise their travel plans.